We also have a page for screenreader-friendly accessible apps at ninite.com/accessible. No toolbars. No clicking next. Just pick your apps and go. We install and update about a million apps each day for our home users and Ninite Pro subscribers. As of February 14th, 2019 Ninite has ended support for Windows XP and Windows Vista as well as the related server platforms Server 2003 and Server 2008. 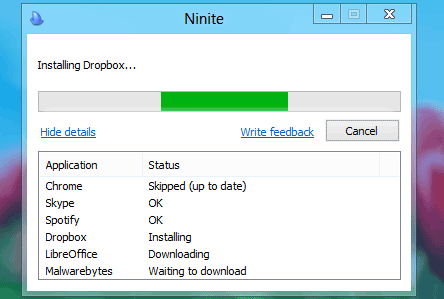 You'll need to upgrade your Windows version to continue using Ninite. Please check off the apps you want above. Ninite works on Windows 10, 8.x, 7, and equivalent Server versions. save you a lot of time! We only add popular user-requested apps to Ninite. I want to see on Ninite. Email me at (optional) when it's ready. 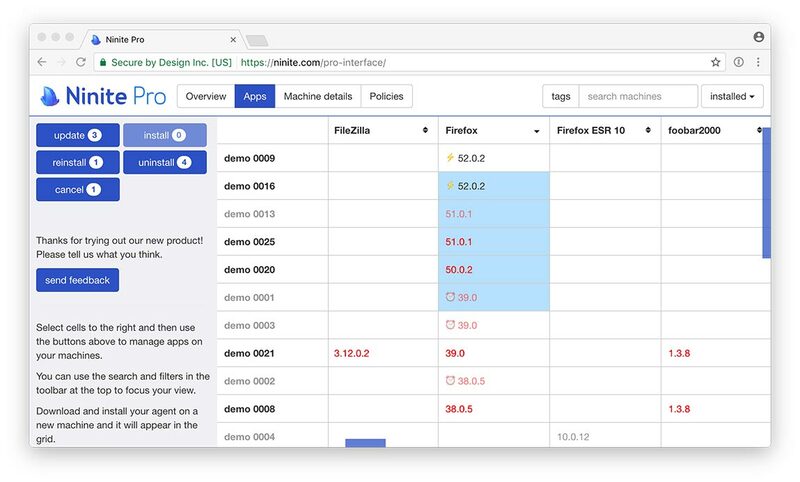 Ninite Pro has a new web interface. Click here to learn more. Our website is free for home use (money-wise, but also free of ads and junkware) because Pro users keep Ninite running.